Coal is the dark brown combustible rock which was generated while land and water plants accumulated and buried during geographical age were transmuted by heat and pressure. It took long time to form thick and wide coal layer of sediment where the ground was sunk slowly. Supposedly, they were buried under the ground slowly while ground was sunk, sand covered it, and plants flourished over it. As to the age of generation, more than 1/3 of world´s coal is supposed to be formed during the Paleozoic era((5 to 2 million years ago) in which coal of Europe, North America, and Asia fall under. The rest seems to be formed in the Mesozoic and Cainozoic era. Most of coal is supposed to be formed in the Carboniferous Period of the paleozolic age (at the end of Paleozoic era). Bracken, Sphenophyta, Lepidendrales, and Codeites were major plants which were 20~30m tall. Coalification starts when withered plants are totally sunk in the water, and air is blocked, so that the plants are no more corroded, and then they get earth pressure and subterranean heat. Although cause of transmutation is yet to be established, they say temperature of several tens to 200°C at thousands of pressure constitutes optimum condition of coalification. Coal is mainly composed of carbon, with a little hydrogen, oxygen, nitrogen, sulfur, and inorganic matters. Most of inorganic matters were brought by underground water after sedimentation, with little out of source plants themselves. Molecule of coal is a kind of high molecule making general aromatic ring its monomer. It becomes anthracite or graphite according to the degree of carbonization. Connected to carbon chain, etc., monomer wraps low molecular. Since 1960´s, oil and natural gas have substituted coal as raw materials for synthetic chemistry. It has become less important source of energy, either, in the wake of appearance of oil. Nevertheless, it covers 26% of total primary energy demand, next to oil. There are coal reserves of more than twice of the sum of oil and natural gas in TOE, except brown coal. A Greek literature shows that coal was used as a fuel in a smithery. A word `coal´ appears in a Chinese literature of 3 Kingdoms Period. Coal was found in Britain well as in German in 10C. Coal was mined and supplied as domestic furl, for which tax was levied in Chinese Sung Dynasty. Coal was commercially mined and used for the first time in New Castle, Britain Henry III permitted mining of coal. Coke was produced and used, instead of charcoal, in iron manufacture inBritain. Demand of coal was increased according to the creation of steam engine by James Watt(Prelude of industrial revolution) William Murdock of Britain produced coal gas. Gas lamp was lighted for the first time in Britain. Method of collecting tar and ammonia from coal gas was found. Barkin succeeded in making synthetic fuel with coal tar in Britain. Fritz Harber found the methodto synthesize ammonia industrially with coal gas in Germany. Bergius created artificial oil according to hydrogen liquid addition of coal in Germany. Methane was synthesized in Germany with carbon monoxide and hydrogen got by gasification of coal. Fischer-Tropsch synthesis was discovered by which oil was synthesized with carbon monoxide and hydrogen. Peat is one in which sediment of woody parts of plants in the water is resolved and transmuted biochemically by fungus. Unlike those in which woody parts are buried and formed by geothermal heat and earth pressure for a long time, it was decomposition of lignin and cellulose in the earth surface, which is a main ingredient of vegetable matter. Lignite, a kind of bituminous coal, and a kind of low-quality brown coal with low carbonization degree, is called brown lignite academically. 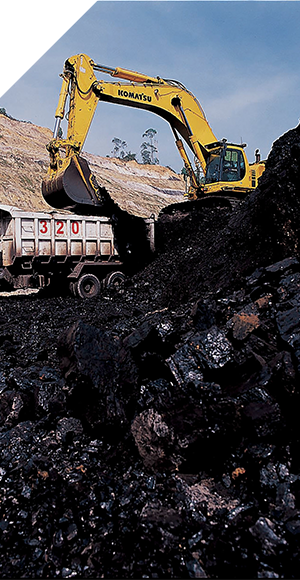 It is dry bituminous coal with low heating value of 3000~4000Kcal/kg, which is used as fuel in some region. Shrunk when a lot of water is dried, woody part lignite (wood grain is visible as woody part organ is preserved) is peeled like a plate, and coal lignite(which has minuteness made of coal and mineral quality) is turned into powder rapidly due to irregular crack. Bituminous coal is a kind of flaming coal with black or dark black color. Also called the black coal, it has glazy or resinous luster. It makes long flame, and ill-smelling smoke when burned. It contains 80-90%. of carbon, 5-6% of hydrogen. Hydrogen decrease and carbon increases as carbonization degree goes up. Its heat value is above 8100Kcal/kg. it is used as coke for iron manufacturing or city gas. Recently, it has become one of the most important resources in the coal chemical industry thanks to a lot of studies on addition and gasification of hydrogen. It is so named because it produces a substance similar to bitumen. 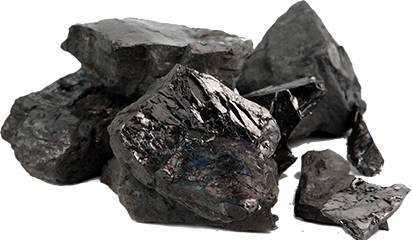 Anthracite is a coal which burns without smoke, as it is best carbonized. The flame is very short and smoke is not produced when burnt, as there is very little volatile matter, with 3~7% of volatilization rate, and very high fixed carbon content, with the rate of 85~95%. Although it is hardly ignited, with its ignition point being 490℃, it has very strong heating power, and maintains constant temperature while burning. It is mostly produced in the old strata of Paleozoic era, while some of the coal of Cenozoic era transmuted into anthracite due to dynamic or thermal metamorphism caused by diastrophism or volcanic rocks respectively.